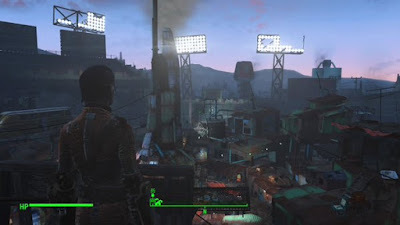 - Though you’ve arrived near Diamond City, you haven’t actually entered the place from the streets. It’s behind a huge door, and you need to speak to a woman named Piper, who’s standing out front. She’ll use you to get in, and a short way in you’ll be confronted by Mayor McDonough, who hates Piper’s newspaper. You can agree with one or t’other of them. You can then ask McDonough for some help, and if you’re convincing enough he’ll tell you about Nick Valentine, a private detective in the city. - Piper will take off, and you’ll gain the quest Story of the Century. 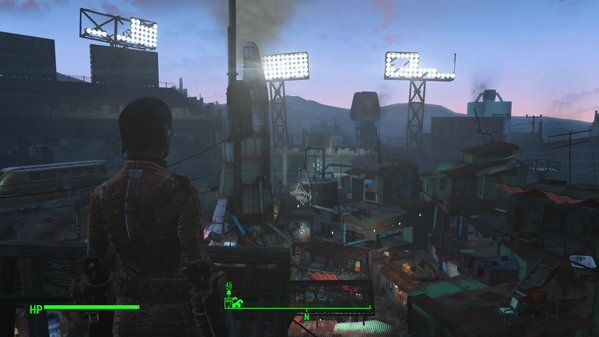 Head up the next set of stairs to enter Diamond City proper. Yay! An actual population centre! There’s lots we can do, and we might as well wander around a bit before getting down to business. Mind that this part of the guide won’t be exploring houses illegally, or locked doors. You trying to get arrested or something? Piper’s newspaper, Publick Occurrences, is the first building on your left. She’s in there now, and you can complete Story of the Century within a minute or two of chatter. Easy 164 experience - and you get Piper on your team, to boot. Woo. Once Piper’s on your team you can loot her house as much as you like, unlike most of Diamond City. There’s also a terminal upstairs with some of Piper’s work. In the very middle of this area is a noodle shop. The vendor is a robot that only appears to speak Japanese. Just say ‘Yes’. Time to go clockwise around Diamond City. Next up is the Super Salon. You can get your hair cut here. When you come in you’ll see an unpleasant woman named Ann getting a trim; you can con five Bottlecaps out of her with minimal effort. Yay! There’s a dude named Sheffield near the Schoolhouse. He wants Nuka-Cola. Give him one and you’ll get 82 experience. Speak to him again and you can send him to any of your settlements as a regular ‘ol Settler. Next up is a proper weapons shop. Arturo offers a ridiculous amount of gear. If you need ammo or weapons… or armour… or anything that kills… he’s a good person to ask. There is also, predictably, a Weapons Workbench beside his stall. Diamond City Surplus is next, but its proprietor, Myrna, is a bit weird. Eventually she’ll sell you all manner of crap, but probably not now. There’s an Armor Workbench beside her stall. There’s a place named Home Plate next door. Unfortunately, it’s locked. You need the key. You don’t have the key. Shrug? There’s a Power Armor Station outside. A doctor’s office comes next. Not only can this dude heal you, he can cure addictions to drugs, cure Rad buildup, and facially reconstruct you, in case you’re tired of your current look. He also sells medicine you’ll probably need. Last before you meet up with the entrance again is Polly, a butcher who specializes in meat. Unless you’re protected against radiation you probably don’t want to shop here. Now for the outer areas. You can watch the Mayor give a speech in the north (yep, this is a baseball stadium, hence the name), visit Diamond City Radio in the north (bet you’ve been waiting to see this guy for a long time), get work unclogging water filters in the east, visit an inn in the southeast, check out an upper-stands taphouse in the south, and plenty else besides. While wandering around you’ll probably hear people talking, as well. You’re likely to pick up a few new locations for your map, as well as the quests Road to Freedom, Confidence Man, and tips about some others. Yep, there’s a lot to explore, and this doesn't cover everything. Ultimately, though, you want to go have a look at Valentine Detective Agency, located in a sort of back alley in the north of Diamond City. He’s not in, and you’ll have to go looking for him, according to his secretary. (And you can press for money.) This will complete the quest and start a new one, Unlikely Valentine. Check the rear desk for a copy of RobCo Fun, this containing the Zeta Invaders Holotape, before you leave.